Jo Ann Hardesty led public testimony on bill to track profiling by Oregon law enforcement. It prompts the state’s Attorney General into review and reporting. 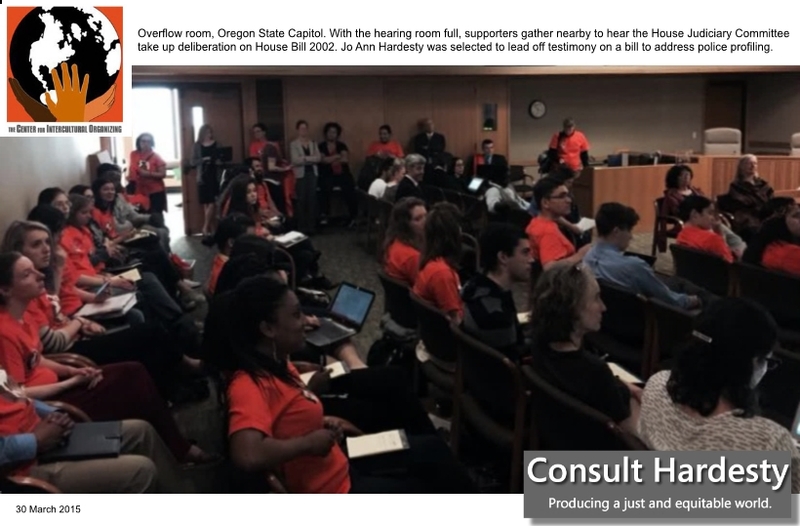 Jo Ann Hardesty testified in favor of House Bill 2002 in the Oregon House Judiciary Committee yesterday. 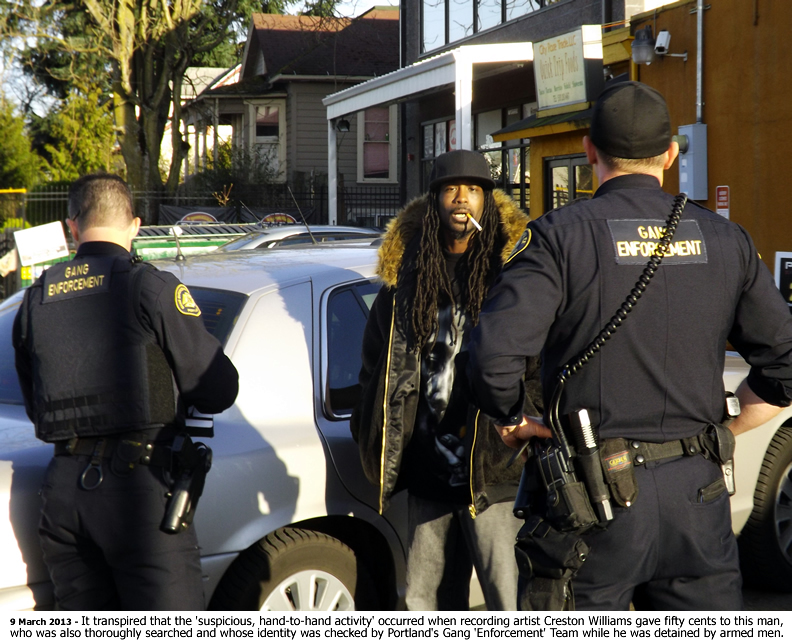 The law would compel the Oregon Criminal Justice Commission to establish independent procedures for receiving and maintaining a record of complaints alleging profiling by law enforcement, and make those complaints available to the state’s Attorney General. The AG could take any action it deems appropriate, but the language indicates investigation and issuing reports merit consideration. The AG ‘may’ investigate: they may go so far as to notify agencies subjecting us to a “high volume” of incidents resulting in complaints. Suggested remedies include arranging cultural competency skill-building through the Department of Public Safety Standards and Training, and ‘requesting’ an agency under the state’s jurisdiction to “discipline law enforcement officers who are the subject of repeated profiling complaints.” Agencies are to include State Police, the state Department of Justice, district attorney’s offices, municipal corporations of the State of Oregon, and tribal governments or universities with law enforcement units. Jo Ann reports, “I assume protests in Ferguson and across the country have influenced Oregon legislators. Gone was the dismissive attitude about racial profiling we’ve heard in the past.” No one in the overflow crowd, not even law enforcement lobbyists, testified against the measure. Familiar rumblings resurfaced … that racial disparities in policing are ‘a Portland problem.’ Anticipating such, Jo Ann demonstrated (below) that our Portland Police Bureau stands as an example to other agencies, in ‘on-the-streets’ training. Further, she countered with Portland Copwatch statewide findings the State had long failed to track. Thank you Chair Barker and committee members for holding this public hearing. I am Jo Ann Hardesty and I am here to support the passage of HB2002 End Profiling. Can you imagine having this dialogue with your ten-year-old child? This hurtful conversation happens in households of people of color on a regular basis: it is why HB2002 is so vital to changing police practices so they respect all of our rights to be safe in our local communities. The history of policing in the U.S. has been fear-based. Since 9/11 fear of others has dominated public debate about what it means to be American. Fear of ‘others’ is reflected in our policing practices throughout the U.S. and yes, even here in Oregon. The U.S. and Oregon Constitutions afford most Americans an ability to freely congregate, worship, protest and seek redress for unconstitutional practices & policies. In actual practice, law enforcement personnel receive exceptions. While the law states ‘mere conversation’ doesn’t obligate community members to interact with law-enforcement, the experiences of African American men & women, immigrants, and others in Oregon have been significantly different: we know not to turn our backs on police officers and walk away … regardless of our right to do so. 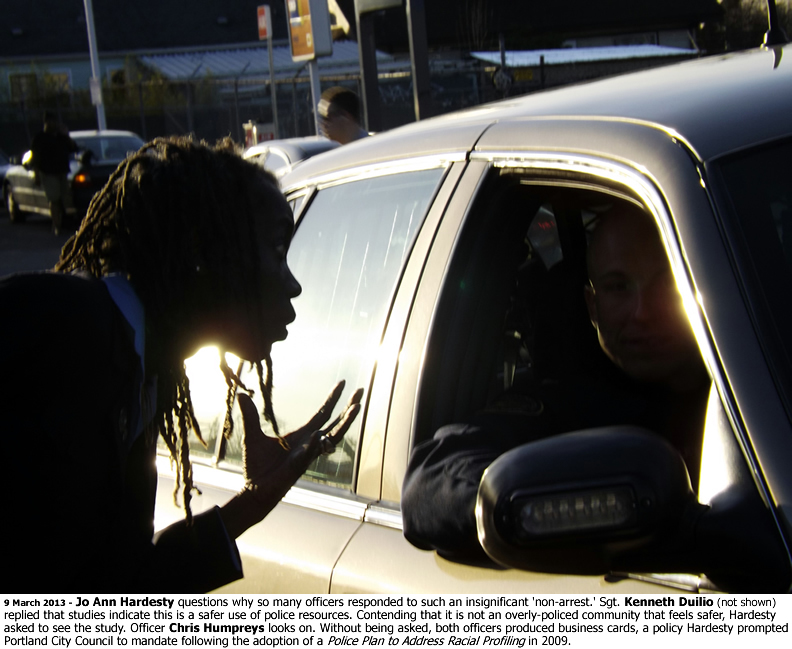 Law enforcement has been trained to engage African Americans, recent immigrants and houseless community members with suspicion of criminality until they prove they are not involved in such behavior. Our legacy of racial bias in policing has led to reduced crime solving, due to trauma communities have experienced, and absence of any trauma-informed approaches to reconciliation and healing. Why would any young person of color call the police to help them solve crimes when these interactions leave them with an image of law enforcement as a heavily armed, occupying force that polices their neighborhood with racial bias? 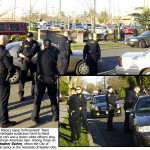 In Portland, the Gang Enforcement Team (left) travels in a pack of at least ten officers. When they stop a pedestrian or driver, one officer approaches the target(s); nine or more surround them within seconds. As a community member watching this one early Saturday afternoon, I parked, took these pictures, and spoke to each of the individuals who were separately stopped and searched. 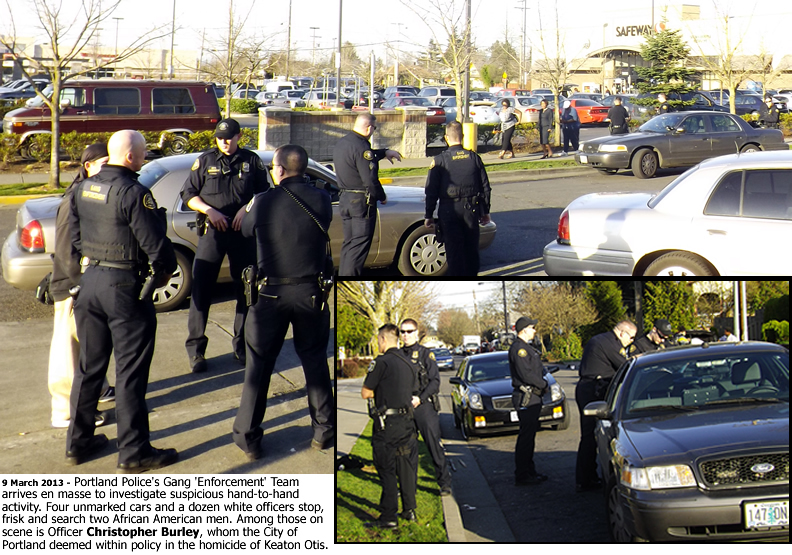 This day twelve officers responded: two were visiting Oregon law enforcement officers observing Portland gang ‘enforcement’ in action. Long story short: one African American man had given another fifty cents … to go into a convenience store to buy a smoke. The police purported a ‘hand-to-hand exchange’ was evidence of a drug encounter. African American men in our community are learning not to shake hands with one another. Speaking with the officers after they completed this stop, I asked whether they realized they themselves were operating as a gang. I challenged the officer in charge to consider the kind of message they sent into our community. The response was, police are safer when they roll out in this manner. There was little acknowledgement of the harm done, even though it extended to all community members who stopped and witnessed public humiliation for no good reason or outcome. Yet, we currently don’t track information on these encounters, or use it to inform training that police receive in the academy and in service. HB2002 provides some clarity around what racial profiling means, and how it plays out in various communities. The requirement to collect data on all police stops is key. Our current, voluntary, system means the most egregious and repressive actions aren’t even tracked unless they lead to arrest. How many people were stopped, questioned, searched for every documented arrest? Voluntary compliance has, over the last decade, led many communities to lose trust in law enforcement … especially in historically black neighborhoods. For redress, we expect you to grant Oregon’s Attorney General the authority to investigate agencies and/or individuals, when a pattern of unconstitutional practices is displayed. Ultimately HB2002 is legislation meant to advance fairness. All community members deserve to relate with public servants who are problem solvers, who work with the community to address community-based concerns. Tracking information on racial disparities may be enough to change behavior if sanctions are built in. Tracking and reporting this information to the legislature is one key to rebuilding trust between law enforcement and the communities they are sworn to protect and serve. HB2002 is a good government initiative. It should be moved to the house floor with a ‘do pass’ recommendation. In closing, I’m told often there are mostly good men and women, working an already difficult law enforcement job, and regulatory legislation adds too many additional reporting requirements to the job. I have two responses to that. If good men and women stand by and watch their colleagues over-police some populations and not others, how good can they really be? And two, reporting back to the public you serve – that you are complying with the U.S. Constitution, regardless of color, religion, sexual identity or housing status – is appropriate. It is actually intrinsic to any commitment to protect and serve. Jo Ann Hardesty, a former member of the Oregon Legislature, served three-terms as vice-chair of the House Judiciary Committee. Jo Ann is a small business owner of Consult Hardesty, a firm specializing in training non-profit and grassroots leadership development. Hardesty also serves as President of NAACP Portland Chapter 1120B. She is on the steering committee for the Albina Ministerial Alliance for Justice & Police Reform (a coalition of organizations and individuals working to reform the Portland Police Bureau). 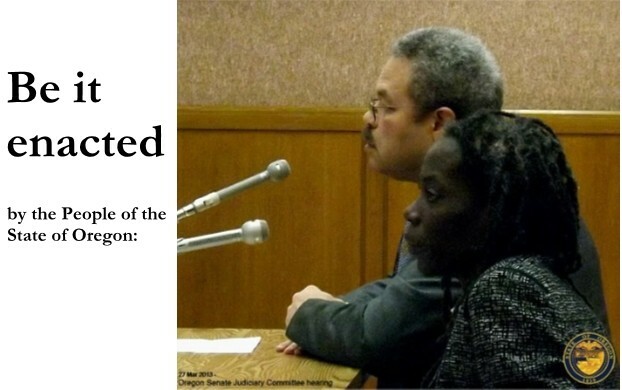 Here is a .pdf file of our testimony. 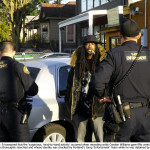 Portland Police treatment of an African American child is depicted here. We depict health effects arising from racial discrimination, at the conclusion of this post. According to this reporting, House Judiciary is chaired by a retired Portland Police Lieutenant. Two of the remaining eight members are retired Oregon State Police troopers.